I’m here for Robin Sharma’s The Inner Circle Business Mastery Summit. Today was the second day and it was really full on and gave me lots to think about. Lots of game changing ideas… (“Change is a stranger, You have yet to know…”, from a posting I made in October entitled “And Onward“). Another day of this before I fly back. Not had much time to blog but I will rectify that soon. Some other things have had to take priority – firstly the course I am attending and then catching up with my own business work. 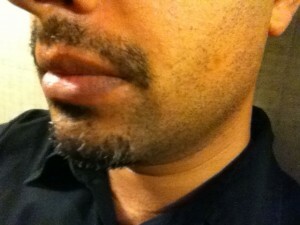 The moustache is now very prominent, and getting a bit itchy. It is also starting to get a bit messy as you can tell from the pic below. So I will need to trim and shape it a bit later tonight or first thing tomorrow. It is now nearly half way through the month of Movember and I would like your help in raising more funds.